We’re spending some time re-thinking old jeans this September on Michele Made Me. So far we’ve made um… let me see… a pendant, lamp shades, a child’s pillow and chair upholstery. 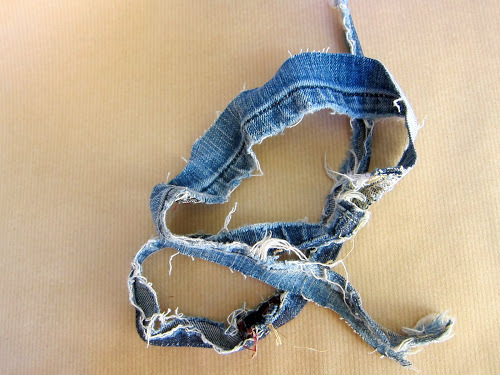 Today’s guest is taking your denim to a whole new place still. Oh, here she is now to tell you all about it… Charissa, it’s all you. Hi readers! I’m Charissa, and I write about creative gift wrapping over at The Gifted Blog. If you’re anything like me, you’re probably a little in awe of Michele. She has a way of coaxing the simplest of materials into something stunning. When I heard about her Drop-Dead Denim month, I wanted in on the challenge! 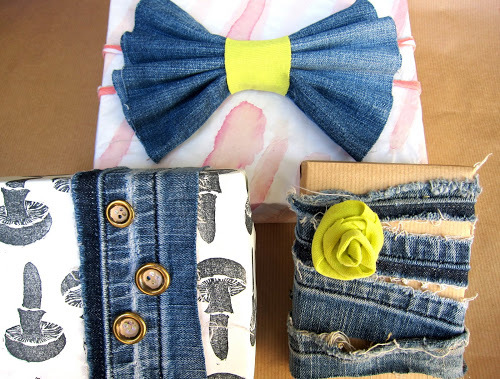 I love recycling found materials into my gift wrapping but I’ve never done much with denim. I had a blast coming up with these 3 gift wrapping ideas and hope you enjoy them, too! 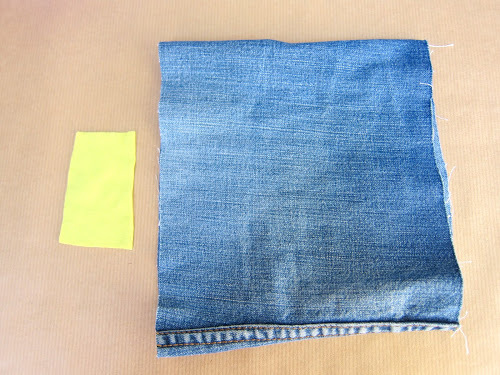 Using a seam ripper, remove stitching from the cuff of an old pair of jeans. And you’re done! 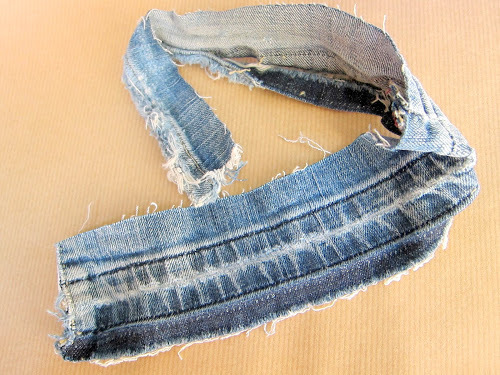 Love how this shows the history of this particular pair of jeans – the original color of the raw denim, the lightening wash it was given in manufacturing, and worn strip of fabric where the cuff hit the shoe. A lovely ombre effect. For this one you’ll need a small rectangle from an old t-shirt and a section cut from a pair of jeans. 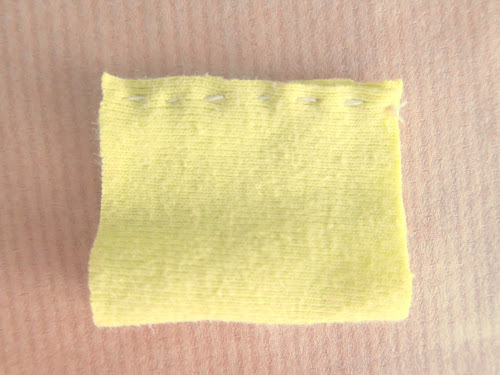 Stitch the rectangle into a loop, securing both ends with sturdy knots. Note the grain of the fabric (the loop should have some ‘give’ when you pull it open). This will let your loop stretch later! Gather denim into pleats. Slip the t-shirt material tube onto one end. Shimmy it into the center to secure the bow. You did it! It really is a happy bow, isn’t it? To secure to your package, slip ribbon through the back of the t-shirt loop and then around the present. Last one! You’ll need the shredded cuff of a pair of jeans (or long strip of similarly distressed denim). Using a seam ripper, unpick the stitching. Wrap around your gift in a spiral, dotting with glue to secure. (Again, I used Aleene’s Original Tacky Glue.) Don’t be afraid to angle each wrap differently. I stopped occasionally to press the glued sections down with my thumb. While probably not the right vibe for a wedding gift, this denim embellishment has loads of personality! 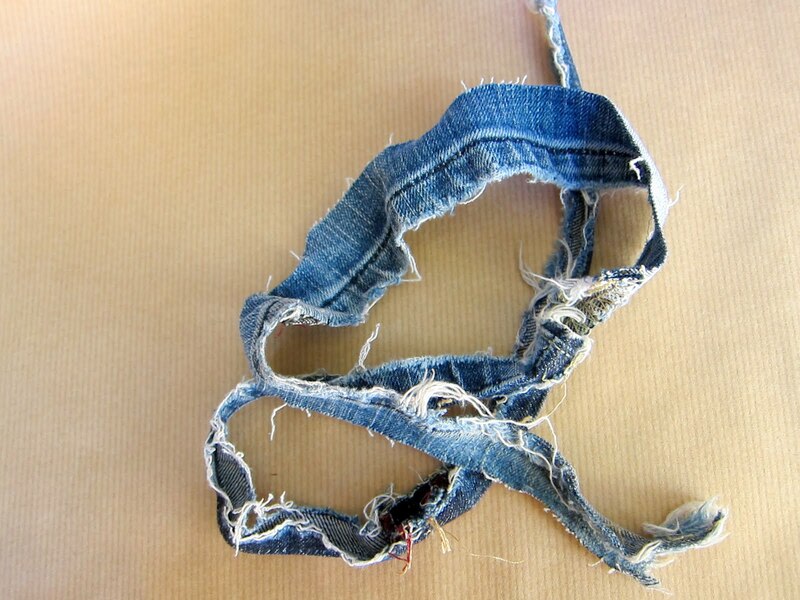 I usually favor a clean look, but made this one loose and messy to compliment the frayed material. I love that wrapping gifts is an everyday opportunity to be creative. I can be found photographing acorns, hoarding envelopes, and printing with celery at The Gifted Blog. 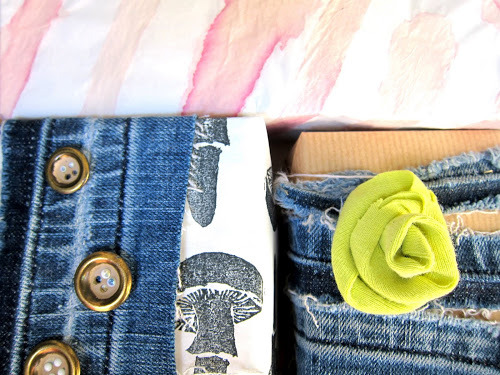 So if you liked these ideas for green gift wrapping, stop by anytime! Michele, thanks for having me. It was a pleasure! The pleasure was all mine Charissa! 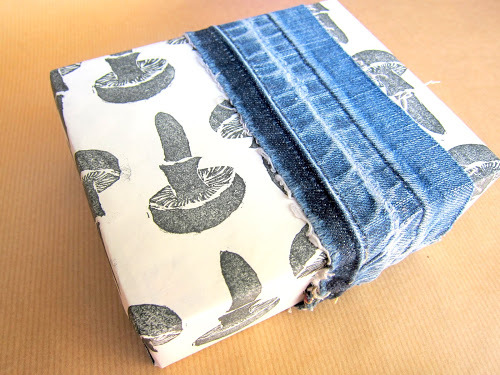 I believe this is the first time I’ve ever seen old jeans used as gift wrap. But you know what? It’s perfect! Especially for those casual gifting occasions that so frequently arise. And you’ve shown us a great variety here which demonstrates the real potential of this amazing fabric as a gift wrap alternative. I will definitely be doing this. Way to go Charissa! YOU have a lovely day now. Aunt Peaches will be running the show on Wednesday. See you then! Those are delightful!!! The ombre idea is really cool. 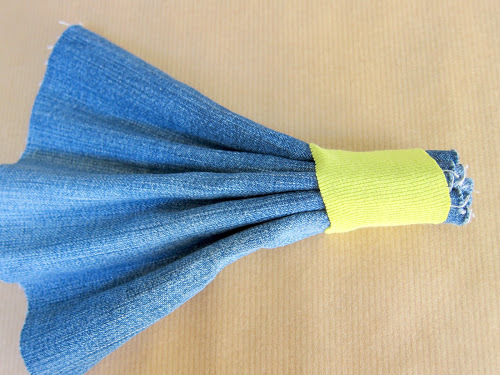 Love the bow, so clever to bind it with a stretchy t-shirt loop. 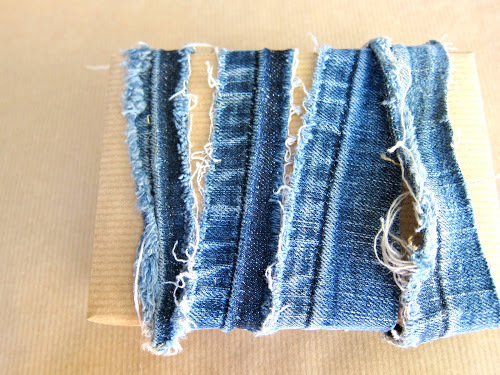 And I love the raggedy look of the last one – a way to use up those bits left over after doing all the other Drop Dead Denim projects. Thanks, you two! These are just genius ideas! What a creative way to use up all those bits and scraps and make a stunningly beautiful presentation. What a coooooooool way to wrap something..yay..very smart 🙂 bow is looking super nice !!!!!! Well you are certainly right about Michele, Clarissa, but you are in the same league! 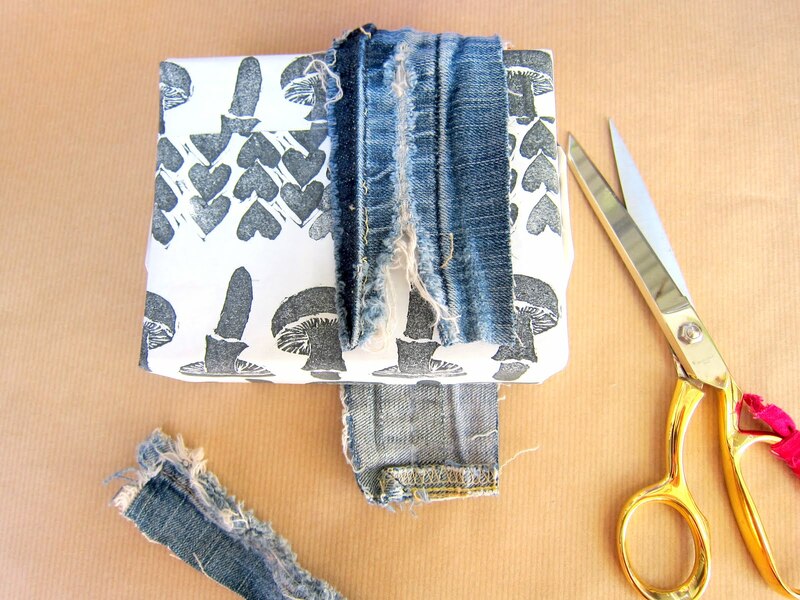 Love the ideas of using jeans for wrapping. This might come really handy! What a clever idea. I love the idea of using those old seams for wrapping. Aw, aren't you all so sweet! Thank you so much for your feedback and kind words. I had a great time thinking up these ideas. Michele, thanks again for having me! 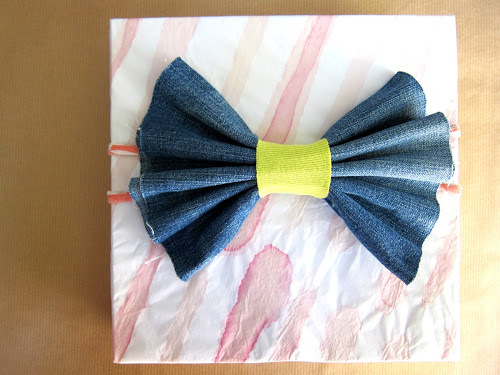 Oh yes, must definitely try the denim bow for future wrapping. 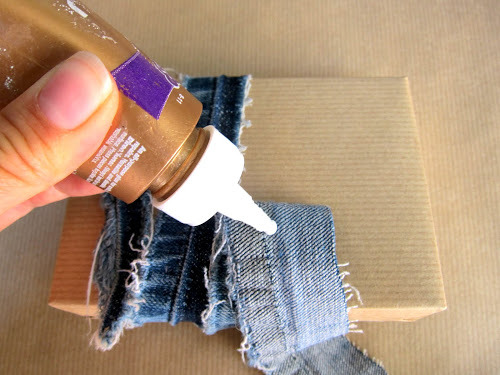 Fun idea for gift wrap, and you can use up pieces that are unusable for any other crafting!